For those who felt as though Sunday, Feb. 14, was better spent without a box of half-eaten chocolates and sappy romantic comedies, San Francisco offered a therapeutic alternative. 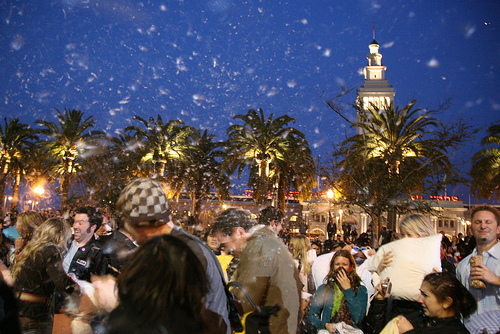 Armed with pillows and maybe a bit of pent up emotion, fun-loving locals arrived at the Embarcadero, ready for the fight to commence. At the strike of midnight 6pm, the crowds wasted no time in rushing towards each other as the feathers began to fly. San Francisco is hardly the only city where these flash-mob gatherings have occurred. Boston, London, Paris, Stockholm, and dozens more have all hosted similarly massive pillow fights. The Bay Area bash, however, tried to keep the environment in mind by requesting that all participants use pillows filled only with natural materials (no synthetics, please) in case some rogue feathers made their way to the water. Because nothing brings down a Valentine’s pillow fight like … pollution. 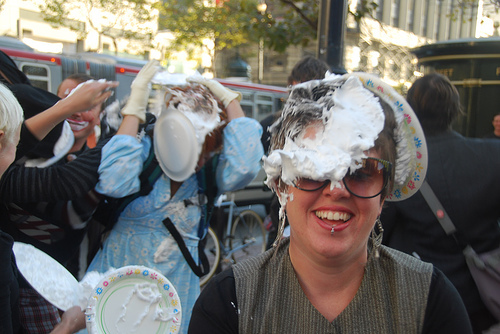 Many of our best memories in SF involve things being pelted at us by strangers, but the flash “mob” tradition may be fading away like the bruises we received from being pummeled by pillows (and the occasional couch cushion) this past V-Day. Today, a flash mob froze on Upper Sproul Plaza as the Campanile struck 1 p.m. The freeze is reminiscent of the impressive mob at Grand Central Station a couple months back in New York. Check out the clip above, which is far more interesting than the pictures posted on the Facebook group (um, you do realize that you’re already “frozen” in a photo, right?). While we at the Clog encourage flash mob participation and creativity, we’ve got to say that standing still for a few minutes–even if you’ve struck, like, the coolest pose ever–is still slightly less boring than just walking through Sproul. C’mon, where are our ninja battles?